Sometimes I think that Michael Crichton has truly lost his mind. Where does he come up with some of his ridiculous ideas? Oh sure, he did write Jurassic Park and The Andromeda Strain, but he did foist his super-gorillas from Congo, his boring Jurassic sequel The Lost World, and his underwater opus Sphere on us, the unsuspecting consumer. But none of this compares to the absolutely head-scratching flick that he wrote and directed, Looker. 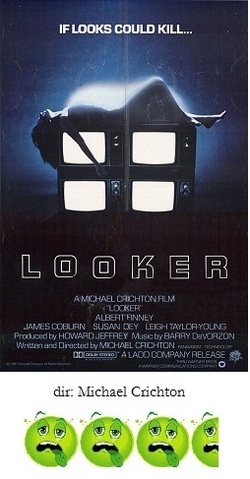 Looker attempts to put a spin on the topics of consumerism, modeling, television, the computer age, and the unwavering sexuality of Albert Finney. To say he fails to do any of this hardly begins to cover it. Finney stars as Dr. Larry Roberts, Hollywood's best plastic surgeon. All of the models simply adore him and want to screw him at every opportunity. But it seems that something sinister is afoot. Several women he "worked" on are turning up dead in apparent suicides. In fact, three of the dead models had surgery done that required specifications down to the millimeter as requested by a company called Digital Matrix. The last model still left alive is plucky, spunky, deadweight Susan Dey (Laurie on The Partridge Family and later a co-star on L.A. Law). What exactly is happening, you ask? Well, at the Digital Matrix company, a new kind of gun is being developed in their "Looker Lab". This gun emits a light that temporarily hypnotizes its victims, which causes them to die, I guess. (One bimbette wraps herself in a curtain and falls from her apartment window, and another also falls and lands on a car.) Anyway Finney and Dey sleuth into Digital Matrix, run by evil Leigh Taylor-Young and owned by even eviler James Coburn, and steal a Looker gun. They do notice that the commercials being produced hypnotize the viewer into mumbling "I want it. I want it." What exactly does this evil scheme hope to achieve? Apparantly, Digital Matrix copies the models' images and uses them for any commercial they want, so the model can be killed and disposed of. I guess they forgot that these chicks have families that will probably notice that their dead relative still seems to be showing up in commercials. Whatever. All of this is just a garbled mess, to be sure. There is a car chase scene between Finney and hit-man Tim Rossovich where they don't shoot at each other, they flash each other with Looker guns. Words do not describe how silly this is. Oooh scary. Later in the film Finney gets flashed several times, since he's been snooping around and getting close to "the secret" you'd think that he would be bumped off while in a hypnotized state? Nah, then the movie would be over. Needless to say I was praying for Finney's death, oh, every three minutes or so. Looker is definitely a low point amongst many low points for all involved, especially Crichton and the once great Finney. Unintentional laughs abound, but the biggest laugh is reserved for the hilariously wretched theme song "She's a Looker" by Sue Saad, you'll be humming it for days afterward, which earns Looker scathing reviews all by itself.